iHerb is an online store based in US which sells nutritional supplements and healthy products in US ,Singapore and other countries. iherb Singapore is more popular among the residents of Singapore as the best place to buy health supplements online.They promote organic products and most of the products are really affordable. How I became an iHerb Customer? Recently I shopped with iHerb and it was my first experience although I’ve heard about this online store before. All that happened accidentally. Actually still my toddler wants me to breastfeed him and I am trying to stop it. I don’t breastfeed him during day time, but still he needs me to feed at night. Refusing this will begin unhappy and stressful moments as he starts crying. I will share my weaning experience later. 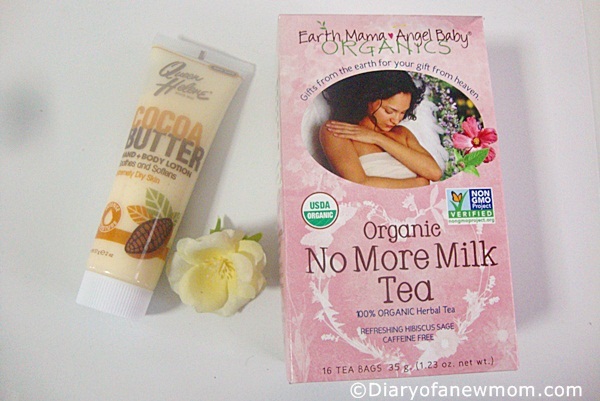 Anyway I finally decided to seek a product that can stop my milk production and came across the ‘Organic No More Milk Tea’ by Earth Mama Angel Baby. This sounds good for me and after reading some reviews I decided to buy ‘No More Milk Tea’. Next is to find an online shop to buy Earth Mama No More Milk Tea. I found few online shops, but they sell the same product for different prices. When I added the shipping cost, the final amounts are really different each other. 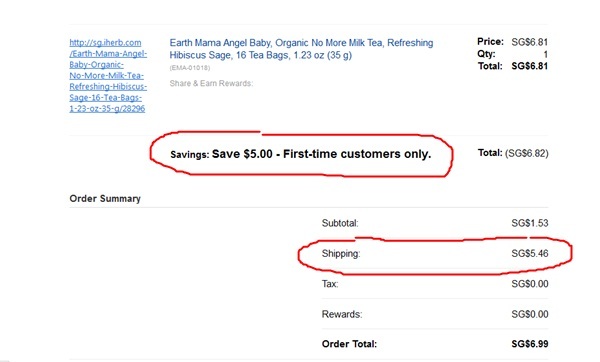 But, I found the price at iHerb is the lowest for the same Earth Mama Angel Baby, Organic No More Milk Tea. They offer shipping for really affordable rate at S$ 5.46 .I read few iHerb reviews and all were positive.This is how I became an i Herb Customer. Shopping with iHerb is really easy and the site is easy to navigate. There are many supplements and other healthy products including healthy snacks for really cheap rates and interestingly these products are natural and organic. Although there are many products which I like to buy, I wanted to try iHerb first. So, it is only Earth Mama Angel Baby, Organic No More Milk Tea. As a first time customer I was eligible for getting $5 discount. When the discount converted to S$ it is a S$ 6.82 which I only had to pay for shipping fee for my No More Milk Tea order. That really sound good, isn’t it? Anyway I added another product to the cart which is a hand and body lotion and it was just S$ 1.54,but the lotion is also natural and organic which includes Cocoa Butter. My experience with iHerb is really good and I received my parcel within 4-5 days. Really nice experience! Use the iHerb coupon QWN933 which you can get US $5 discount when you become a first time customer. Free Products – In this page, you’ll find free products which are for the first time customers. To get the product free you need to click this link. Special Deals, Clearance Items, Limited-Time Offers! Kids and babies products which include organic snacks and even toys. There are many other products including healthy snacks. Here are few ways you can save when you shop with iHerb.com or with iHerb Singapore. If you are a first time customer you can get USD5 discount for your first order. To get that you need to purchase through affiliate link or need to use a discount code. If you use this link to iHerb.com, you’ll get the $5 discount when you check out. Shipping rate is really cheap to Singapore which is around S$ 5.46 for my order. When you order more than $40, you will get really good discounts on shipping. For US orders, shipping is free when you order more than $20. Check the iherb trial section. There are many full size products which you can buy for really cheap rates. When you have some more weight remaining in your order, you can utilize that for buying such products and save on both product cost and shipping cost. When you continue shopping with iHerb, you will get loyalty credits 10% for your each shopping experience which is another way to save when you buy healthy organic products. You can also refer others to iHerb and earn $5 for your each referral. This is a pretty good way to continue with organic product shopping. All these sounds good isn’t it? I actually placed my second order with iHerb Singapore and waiting to receive it. I specially ordered some organic snacks instead of buying potato chips from the local store. Check iHerb.com .You’ll sure love to shop with them.